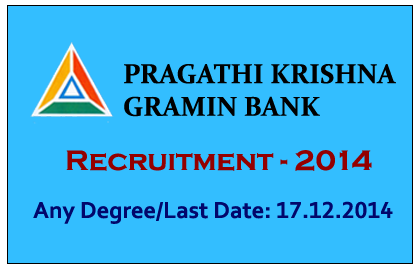 Pragathi Krishna Gramin Bank has announced recruitment for the post of Junior Management (Scale-I) and Office Assistant (Multipurpose. Total number of vacancies 431 posts. Eligible candidates can apply online for this post from 03.12.2014 to 17.12.2014. More details about this recruitment were mentioned below. Candidates those are qualified in the RRBs-Online CWE-III held on Sep/Oct 2014 by IBPS were eligible for this post. And they should obtain the marks as mentioned below. Selection Process: Candidates will be selected on the basis of the performance in the IBPS RRB CWE held in Sep/Oct 2014 conducted by IBPS and personal interview. How to Apply: Eligible candidates can apply online through the bank’s website:www.pragathikrishnabank.com from 03.12.2014 to 17.12.2014.